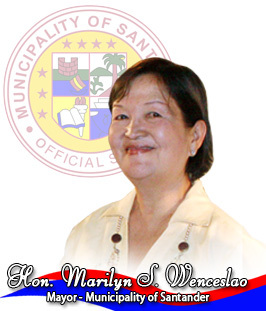 Seeing the need to help her fellow Tanyonganons solve the problems in their town, Mayor Marilyn Wenceslao left her quiet, private life in 2001 to run for vice mayor, at the age of 57. Tackling a well-entrenched political family, she was successful in her bid alongside her son, Wilson, who became mayor in 2001. Known for being soft spoken and her piety, Mayor Marilyn Wenceslao had for nine years successfully steered the Municipal Council in unity and one direction. She also made much accomplishment as head of the tourism council and heritage council of the town, aside from being active in all other endeavors for Santander. While she was presiding officer, the council passed landmark pieces of local legislation on preserving the environment and protecting local heritage. These include the ordinance declaring the whole town as a bird sanctuary, the ordinance establishing the Pasil Marine Sanctuary, and the ordinance declaring more than 100 places and structures as cultural and historical properties. With her nine-year stint as Santander’s second-in-command and top person in policy-making, she has shown the zeal, passion and dedication to efforts for development. And these are some things that the public can still expect now that she just entered another field in public service, that of being local chief executive.